Chievo or Roma? The team from the bottom of Serie A table or a candidate for the Champions League? Obviously, AS Roma are the favorites here, but Chievo have nothing to lose. They can play all-in and try to get themselves the second win of the season. They’ll surely have the support from the fans at Stadio Marc’Antonio Bentegodi in Verona. But, do they have the quality needed to win even a single point against Roma? Find out in our Chievo vs Roma prediction and betting tips! Chievo have the oldest squad in Serie A. Actually, the two oldest players in the league are Chievo players. I’m talking about their goalie Stefano Sorrentino and their second-best scorer Sergio Pellissier. Having an older squad than anyone else means that Chievo aren’t too good in terms of stamina. But, they’re really good in terms of experience. And experience is exactly what they need to pull themselves away from the pit known as the relegation zone. Unfortunately, the situation does not look too good for them. They have only 9 points, half as much as Empoli who are the nearest team in the safe zone. On the bright side, Chievo have started improving their form. They beat Frosinone in the last round of Serie A in 2018. A month later, they put a pretty decent performance against Fiorentina despite losing that game 4:3. And in the previous round, they played 2:2 with Empoli. Their defending has been poor, even though their goalie has shown he’s still pretty good on numerous occasions, e.g. saving Ronaldo’s penalty. However, despite Sorrentino’s efforts, Chievo have still allowed 44 goals, more than any other team (apart from Empoli who also have 44 goals conceded). Considering how poor Chievo have been in defense, it’s fair to say that AS Roma players are expected to put away a few goals on Friday evening. And their attack has been their main weapon this season. In fact, they’re the 4th best team in terms of scored goals. But, their defense hasn’t been that impressive, especially not in the last few weeks. On 30th January AS Roma lost 7:1 to Fiorentina in the Italian Cup, even though all of their regular defenders were in the starting 11. And when it comes to Serie A, this team has allowed 6 goals in the last 3 matches. It seems as if their defenders have been more focused on attacking then defending this season. Kolarov, for example, Roma’s left back is currently their second-best scorer. 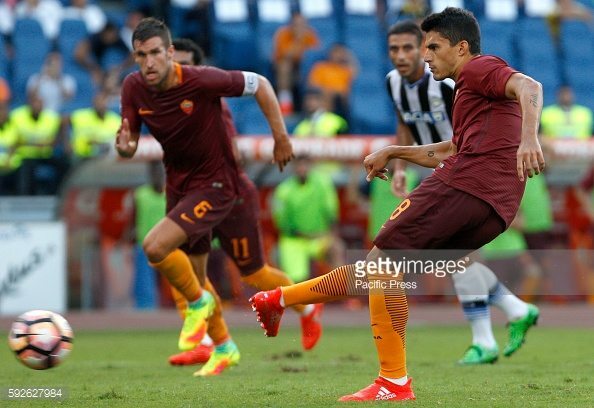 Furthermore, Fazio has scored 3 so far, Florenzi 2, while Juan Jesus and Manolas each have one goal to their name. All of these promises that we’re going to see many goals on Friday evening, probably on both ends. Another thing going in favor of this is the head-to-head history between these two sides. In 2018, both of the matches they played saw Over 3.5 Goals. And since 2015, only one of their duels went Under 2.5. I have zero doubts we’ll see many goals here. AS Roma are likely to win big here, but I wouldn’t be too surprised if Chievo managed to score at least once.